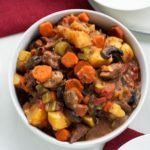 Slow Cooker Beef Stew - Easy Crockpot Recipe Ready in 6 Hours! Like my Slow Cooker Sausage and Cabbage recipe, this is pure comfort food. 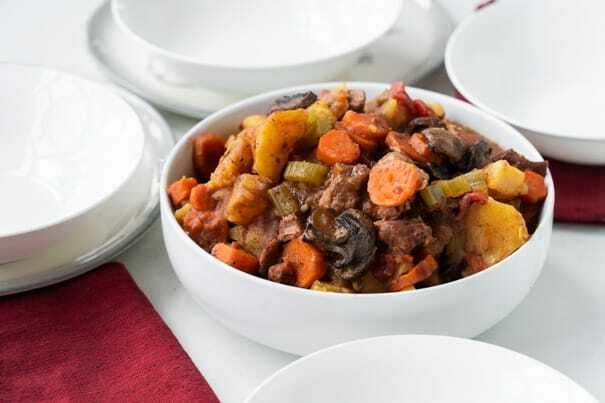 This beef stew is slow cooked for 6 hours on high, alongside vegetables, making it a full meal to be enjoyed. Sometimes I serve it on egg noodles or rice, or sometimes I just serve it by itself. If you have any leftovers (which I doubt you will because it’s so good), it’s even better the next day! This recipe calls for 2 pounds of stewing beef. After cooking for 6 hours (on high) your meat is going to be tender and easy to cut through. 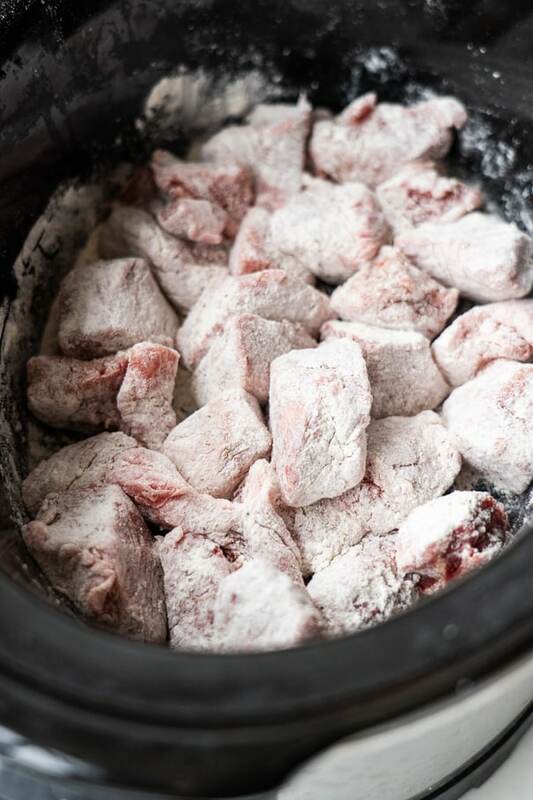 This recipe is a Slow Cooker dream come true! 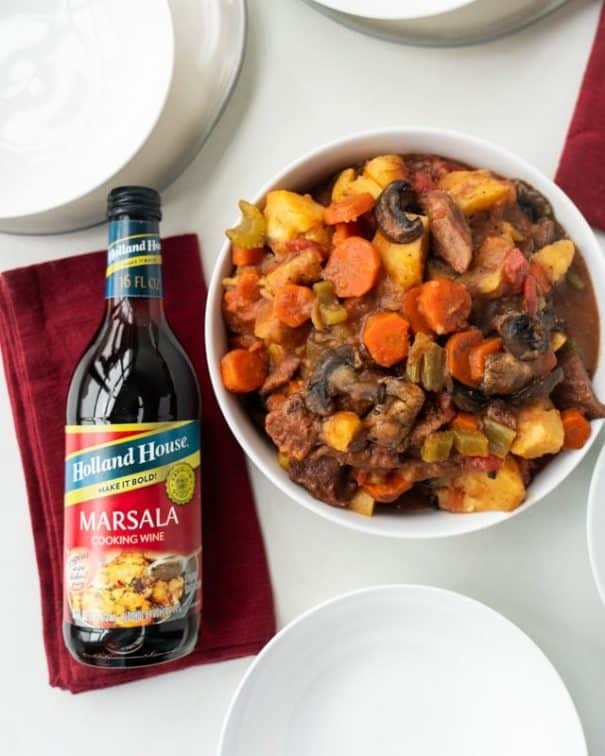 The beef is going to be tender, moist and delicious – thanks to the Holland House Marsala Cooking Wine that it’s being slow cooked in. 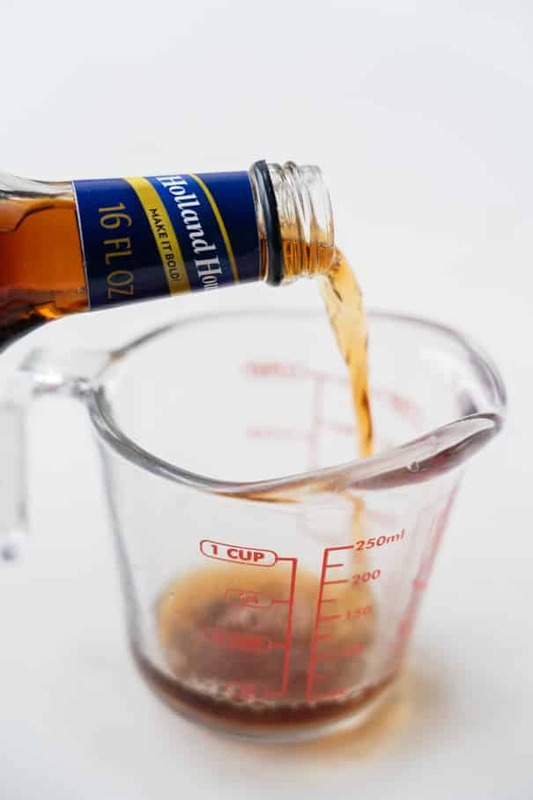 You will use 1/4 cup of Marsala Cooking Wine to create a bold flavor to the beef. I love using this cooking wine in so many cold weather recipes because it easily elevates the taste, from easy weeknight rice meals to gourmet chili on the weekend. This Marsala Cooking Wine is a winner with beef dishes, from this Slow Cooker Beef Stew to Beef Stroganoff and everything in between. It gives the dish a bold, sweet-wine flavor with hints of hazelnut. You guys, just trust me, it’s perfect. Make sure to check out their other flavor boosting wines besides Marsala, such as Sherry, White, Red and White with Lemon! 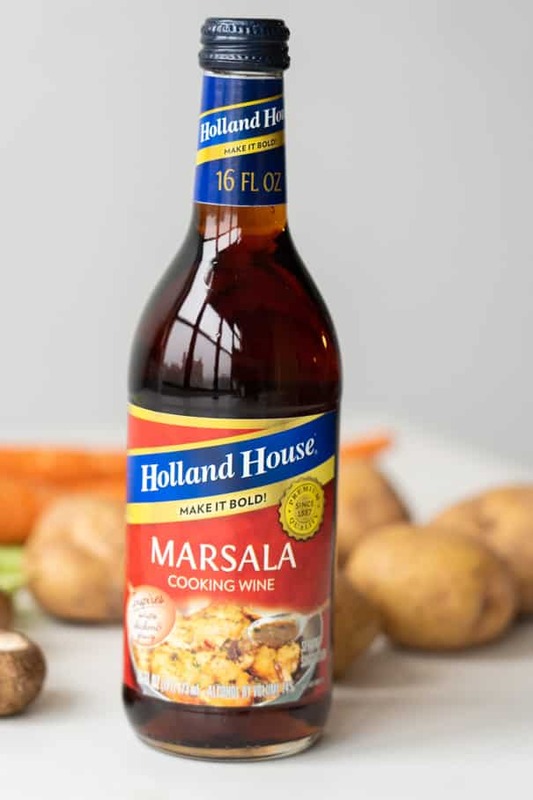 Here’s a coupon for Holland House Cooking Wine if you want to try it yourself! And here’s some other delicious recipes you can use it in! Be sure to follow Holland House Cooking Wine on both Facebook and Pinterest! Alongside the beef, you will need lots of vegetables. This is going to make it a complete meal! 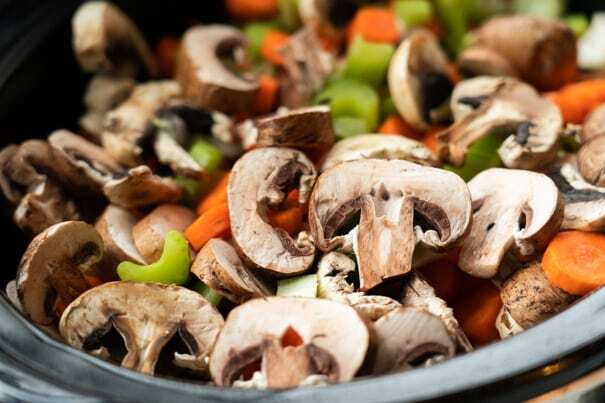 You’ll need potatoes, carrots, celery, mushrooms and onion. 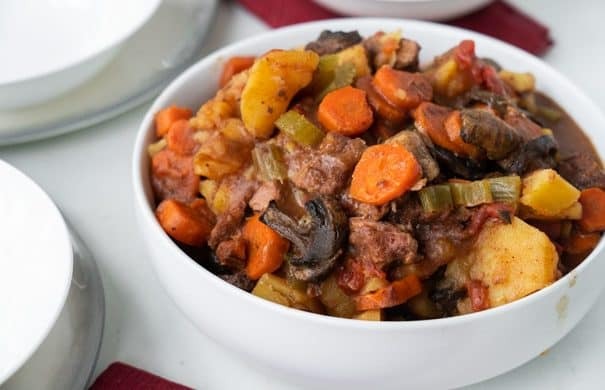 Some people don’t like mushrooms in their stew and that’s ok, you can leave them out if you want. If you’re like me though, you love mushrooms… so add them in. 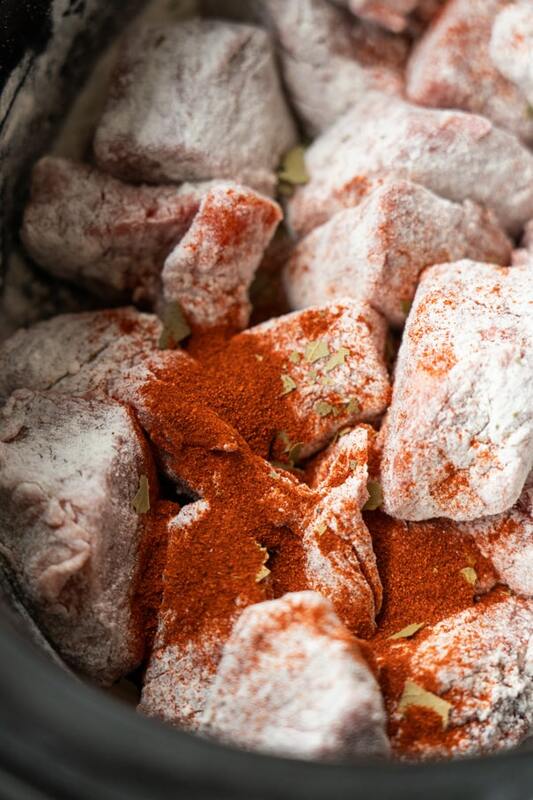 You’re going to coat the beef in flour, salt and pepper first. This is supposed to be an easy recipe, so you do not need to brown the beef first. Just coating it in the flour is going to allow the Marsala Cooking Wine and beef broth to still stick to it. 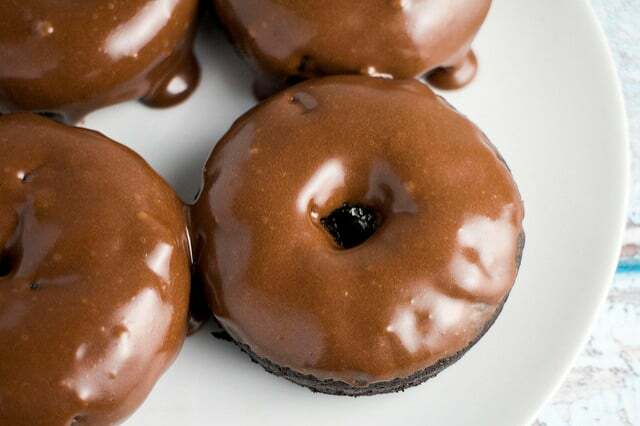 Trust me, every bite will be tasty! Now add in some garlic, bay leaves and paprika. Not only are these going to give the stew flavor but your house is going to smell great! I live in an apartment building and you can smell this dish all the way down the hallway, making my neighbors tummies grumble! Add Marsala Cooking Wine, beef broth and Worcestershire sauce in. You will need 1/4 cup of Cooking Wine for this recipe. Finally, add your vegetables into the slow cooker on top. Close the lid and cook on high for 6 hours, or low for 12 hours. 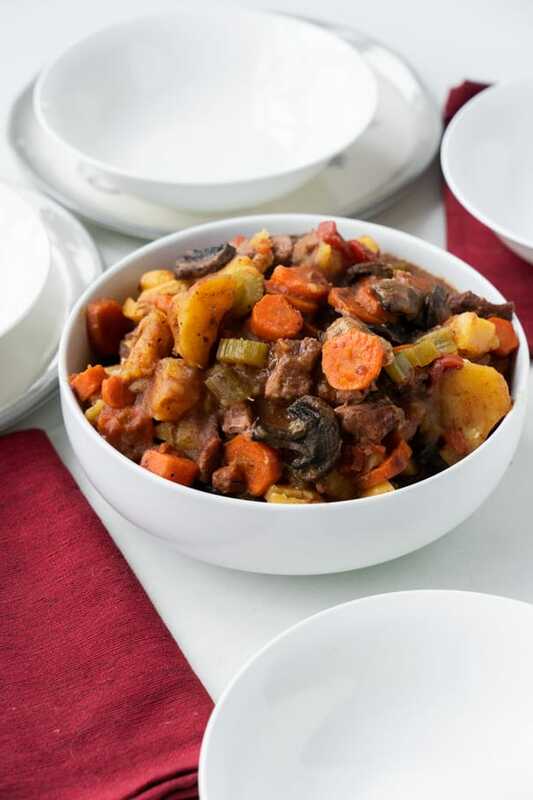 After your 6 hours is up, grab some bowls and fill it with this Beef Stew! Sometimes I serve it on top of egg noodles (that’s my husband’s favorite way), or rice (that’s my daughter’s favorite way) or just as is (that’s my favorite way!). Geeze, my family has opinions! 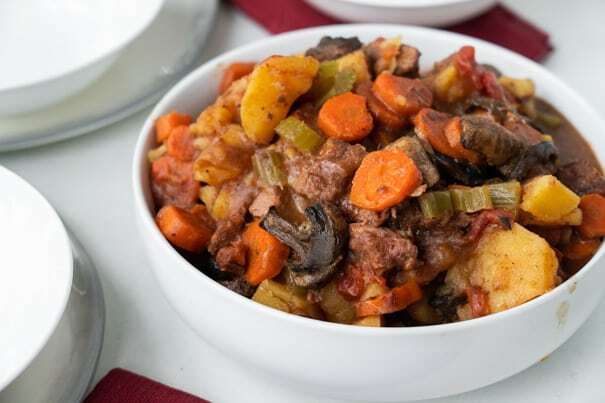 This Beef Stew is so savory and delicious. 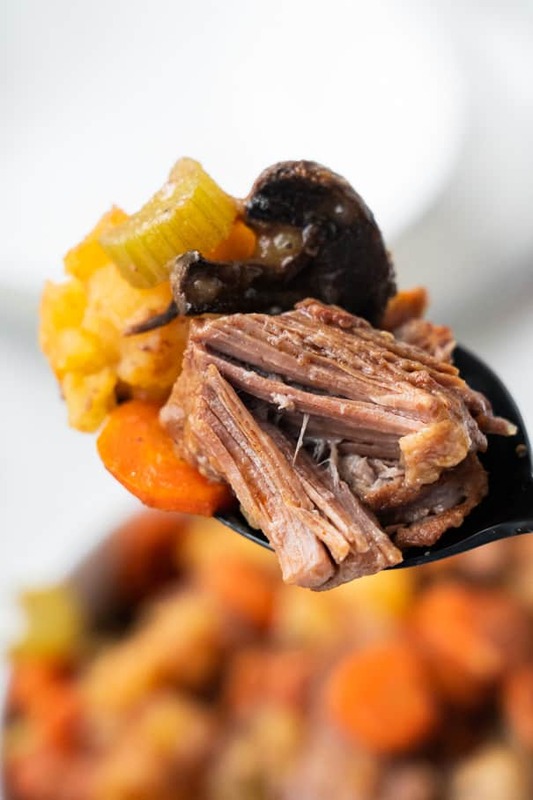 The slow cooker taste of the beef broth and Marsala Cooking Wine really shines through, making everything coated in flavor! Yes you can! I freeze my beef stew in glass, freezer safe dishes in proportions that match my family (usually 2-3 servings). Defrost in the refrigerator overnight, or if you forget, throw in the microwave to defrost and heat up for a few minutes. 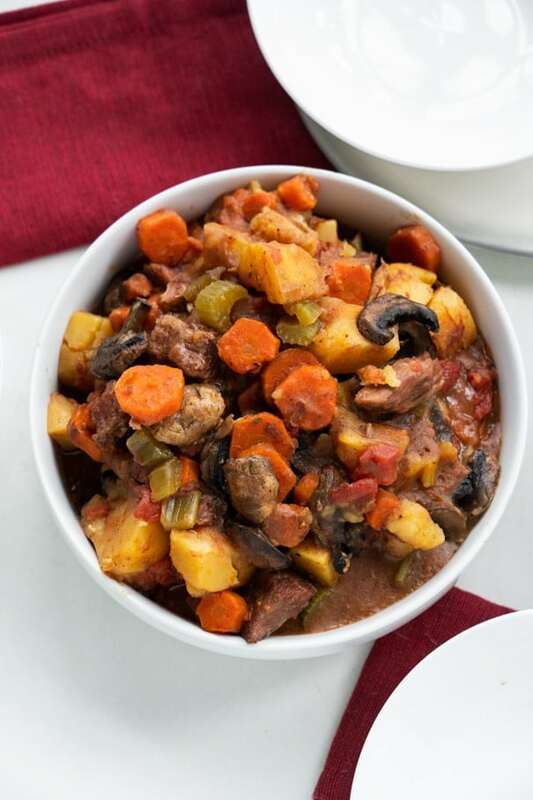 I hope you and your family enjoy this Slow Cooker Beef Stew as much as we do! Enjoy it for dinner sometime soon! 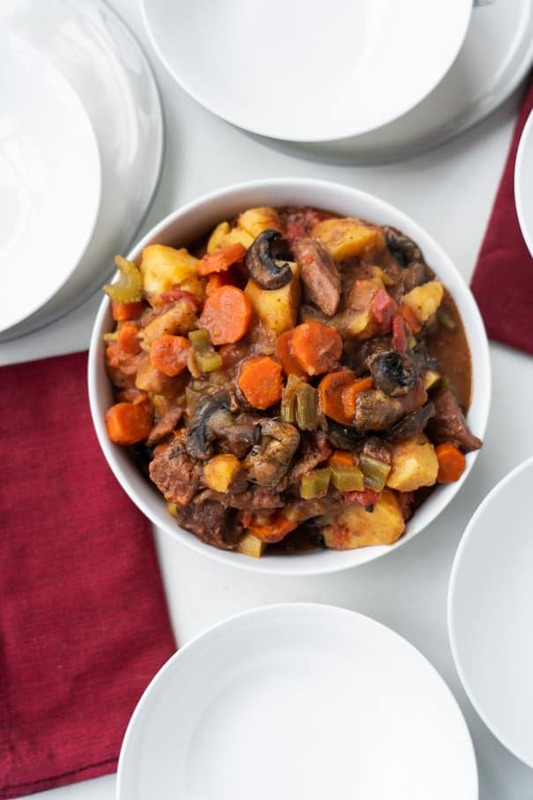 SLOW COOKER Beef Stew with Marsala Cooking Wine made in the crockpot in 6 hours! This easy recipe is packed with vegetables creating a full classic meal. My husband declares this one of the best dinners! Place beef in slow cooker. Add flour, salt, and ground pepper and stir to completely coat the meat. Add garlic, paprika and bay leaves to slow cooker and stir. Add cooking wine, beef broth and Worcestershire sauce to slow cooker and stir. 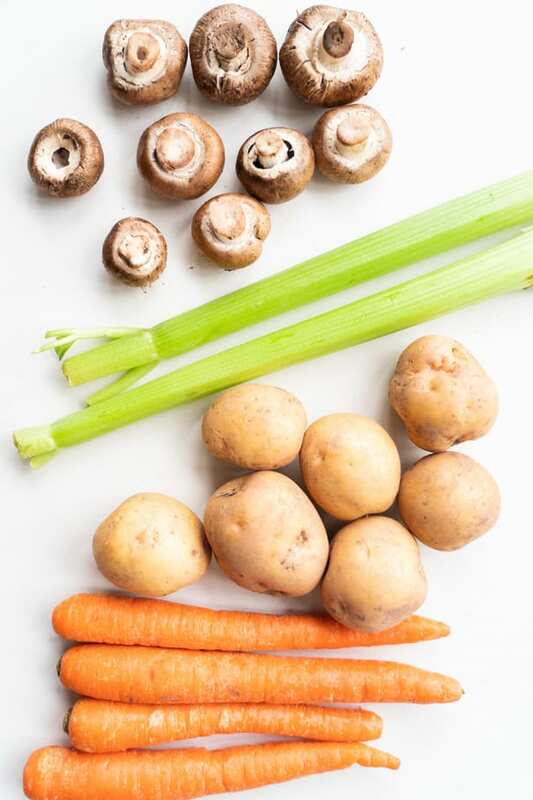 Add potatoes, carrots, onion, celery, mushrooms and diced tomatoes. Close lid and cook for 6 hours on HIGH or 12 hours on LOW. Serve by itself or over egg noodles. Enjoy!